Perfect! Love the pun, too! Wish I could be there. Thank you, Rhonda :) Me too! 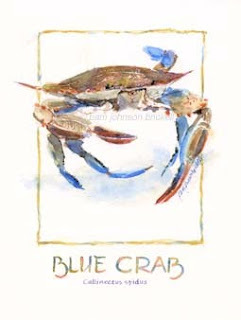 Love your blue crab sketch!! Thanks, Ronelle! I've so been loving your Hawaii sketches! I stumbled onto your blog and I'm glad I did! The blue crab is beautiful. I really like how you combine the lettering and the border with the crab itself. Is the lettering watercolor also? (- Forgive me if you stated this somewhere and I missed it). Good luck at the Festival! Happy you found me! After I finished the crab, I laid tissue paper down and played with box shapes to try and accent the crab. Once I was happy with the shape and position, I wet my brush with water and drew one line at a time, filling it with touches of watercolors so they'd blend on the paper. The same technique was used for the type. I love adding calligraphy to my pieces. This piece was done on a 7 x 10 watercolor block of Portofino acquerello 140# HP paper. The crab was a big hit at the show. Note cards sold like crazy, along with reprints of the original.